A friend and I are driving into Tucson to see Gone With the Wind on the big screen next week. I can't wait! I thought for about 10 minutes about rereading Margaret Mitchell's book in preparation. Then I remembered that I went through a full box of tissues when I read it the first time and decided against it. I am anticipating both the movie and the experience. We're eating lunch out before we catch the flick, so I've already decided that I'll postpone buying my popcorn and Diet Coke until the intermission. Isn't an intermission just so fun? And I've already been reflecting on my favorite scenes from the movie. I love the opening with Mr. O'Hara surveying his cotton fields. And then don't we all love seeing Scarlett sitting on the front porch steps of Tara with all her beaus swooning over her? All except Ashley, that is. 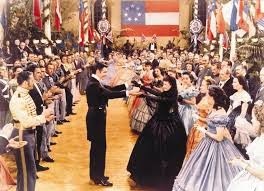 I'm also especially fond of the scene where Scarlett and the ladies of Atlanta are hosting a ball or gala of some sort for the war effort. Scarlett is in mourning attire in honor of her late husband who has died on the battlefield. But, while she watches the dancing from the sidelines, we catch a glimpse of her toes tapping to the music underneath all of her petticoats. She's in mourning (sort of), but she's itching to dance! And dance she does! With Rhett Butler! Shamelessly! Others are appalled at her dancing in mourning clothes, but you know Scarlett! Fiddle-dee-dee! Now Scarlett was mourning on the outside with her heavy black gown, but in her heart of hearts she was pining for Ashley. The only thing making Scarlett sad was that Melanie was wed to her beloved Ashley instead of her. But you may indeed be mourning. You probably are not wearing all black, but your days may feel dark and your mood may be heavy and solemn. Loss is hard. Change is hard. Hurt is hard. And there are times when indeed our hearts feel like they will literally break. In fact, there are times when we feel like we are truly broken. And we wonder if we'll ever feel whole again, much less feel joyful, happy. Grief takes time. And it includes so many ups and downs; sometimes it seems perpetual and eternal. We imagine that we will surely carry this dull and weighty ache in our hearts every day for the rest of our lives. At certain stages in grief, we even feel like we're supposed to be sad forevermore, that it would be disrespectful or disingenuous to be otherwise. At other times we try desperately to lift our own spirits or at least to somehow ignore the constant ache...but we just can't. That my soul may sing praise to Thee, and not be silent. Read those verses one more time, this time looking for the extreme contrasts David draws. Could that be right? Can a mourner (not the Scarlett O'Hara brand, but a genuine and sorrowful mourner) truly go from weeping to shouting for joy? Can you really go from mourning to dancing? Dancing??? Was David taking poetic license here? Or is he serious? Knowing David, the demonstrative, dancing king, he literally meant the Lord had lifted his spirits so much that he indeed left his sackcloth behind, donned his dancing duds and took to the dance floor. I believe God can do that for you and me, too. And I have no idea what or who you have lost. I understand the loss of a child is the toughest to be borne, but I haven't experienced that. So I do not pretend to know the depth of your pain, whatever is causing you to mourn. But I do know the power and depth and love and grace and goodness of our God. And I know He has the power not just to change circumstances, but to change hearts, lifting and soothing and healing and restoring and, yes, infusing with supernatural and splendid joy. You may mourn today. And if you do, cry into the welcome arms of your Savior. He truly cares. Cry and vent and hurt. Allow Him to press in on your wounds and stop the bleeding. Allow His Word to soothe you like the balm it is. And rest, sweet friend, in His strong embrace. There is a time for mourning. You, unlike Scarlett, may indeed need to take the time to mourn. But know this. You will dance again. Maybe not later today. Maybe not tomorrow or even next month or the next. But one day, by the grace of God, you will dance again. And when you do, remember Psalm 30:12, and give a shout out to the One who has restored your joy. Maybe, like Scarlett, you already feel your toes tapping and you're just afraid to get out on the dance floor for fear of relapse or being misunderstood or letting go. Let your sweet Savior take you by the hand and lead you out to a wide open place where joy comes in the morning. Kick up your heels and dance the Cotton Eye Joe...and dance with Jesus! There is a time for dancing. So trust that it will come. Could I pray for you today? If this blog post has spoken to you and you have been waiting and hoping for healing of your broken heart, would you let me know so I can pray for that comfort? Just leave a short comment; you don't even have to leave your name, just a word or two. I'd love to pray for you.